“The Royal Hobgoblin, Spook, Imp, and Bogie Marching Society,” by Seth. A Ph.D. in E.S.P. has treated the local illusionist Mysterion better than an M.B.A.
A selective history of the scariest night of the year—from All Hallows to zombies. Toronto zombies walk the walk. Slowly. Two local artists prove you’re never too old for trick-or-treat. Yes! Tell me how I can get 4 great issues of Taddle Creek for only $18! 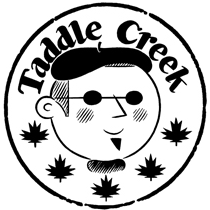 Sign up for Taddle Creek’s infrequent mailing list to be the first to find out about upcoming events, upcoming issues, and probably-already-happening on-line exclusives (the Web moves quickly). Come on, give Taddle Creek your E-mail address!